hello I have a little problem with a model of vincent coming from dirge of cerberus that I find on the internet when I open it with kimera it all seems good. 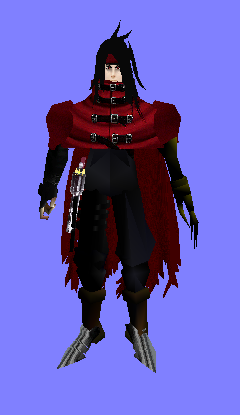 but in the game when vincent is in the screen his cerberus disappears from his holster and my game slows down this is the only time or the slowdown occurs, and I would just like to know if it is this model that causes a problem or if it is my graphics card that lacks power or anything else for this particular model. hi in the forum of ff7 music we are told that it is obselete but in the forum of anxious heart it is not possible to download you have a solution please ? Graphical Modding / vincent hi res model ? Completely unrelated / anybody has tseng or elena or tifa or yuffie or cid or red or rufus rel 3dmodel? Graphical Modding / Anybody has a model of tifa? Anybody has a rel model of tifa?